Vangi Bhath was something I hated when I was child. It's a grown-up taste. I still remember the shudders in my little body if Mom announced: Vangi Bhath for dinner, tonight! Today, I miss her and I miss her Vangi Bhath. I make a pretty decent Vangi Bhath but it never is the same, is it? I made this on Sunday night for dinner. I realized as soon as I took a bite that this was a little above my soon-to-be 5 year old's level of spice. But she smothered it in plain yogurt and chomped right through it. She does not have regular kiddie tastes. She loves veggies and will eat okra by the spoonful. Heat the oil in a large non-stick pot. If it heats to a point where it starts fuming, turn off the heat and let it cool some. If you use a regular pot that is not non-stick, you may need to increase the amount of oil. Toss in the whole spices. Be careful as the whole black peppers tend to leap out of the pan and right into your eyes. It is usually a good idea to cover the pan while the whole spices get heated up and start releasing their true flavors. Add the cumin seeds and let them splutter a little bit in the oil along with the rest of the whole spices. Add the sliced onions and saute for about 4-5 minutes on medium heat. Add the potatoes and the diced eggplant and saute for another 2-3 minutes. Add the ginger and garlic and saute for another 2 minutes or so. Add the rice and saute that for a minute or so with the rest of the mixture. Add the water, sugar and salt to taste. There is an easy rule of thumb to figure out if the salt will be adequate or not. You can of course add the salt afterwards but it takes away from the heavenly flavor of the dish. Add about 1 teaspoon full of salt after you have added the water. Mix it well. Taste the water. It should be slightly salty. Add a little more salt, mix and taste again. Stop when the water is just slightly salty. Cover and cook the mixture on medium-high heat till you no longer see the water when you peek inside the pot. About 10 minutes. Turn the heat to low and let the rice simmer till it is fully cooked. Another 20 minutes or so. The rice grains should be separate - not all mushed up - and each grain must be fully cooked yet retain its integrity. Wow! I love that! Rice retaining its integrity!! Garnish with fresh cilantro and serve with plain yogurt. Goda masala is a wonderful blend of spices that has been powdered with a surprise ingredient: dried coconut. I say surprise cos I hate the smell of dried coconut. But in this masala, it's divine! Note that we don't say curry - we say masala. Curry is any dish that has some kind of sauce. 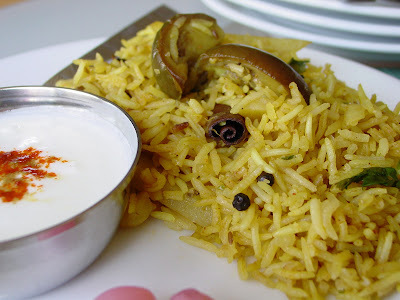 The dish is not dry and can be poured over rice or dipped into. So chicken curry means it is a chicken dish that is not dry and has a sauce. To get back to the point, you can buy goda masala from any Indian grocer nearest you. The brand I recommend is Badshah (means king!) Or you can use regular garam masala - which does not usually have the dried coconut. Or try the Madras Periyar masala - brand MTR. This has the dried coconut. Don't have it? Just ignore it ;-) But if you decide to leave it out, then make sure that you use the whole spices. The rice will be a total disaster if BOTH these are missing. Or borrow some from a friendly Indian neighbor!! Once the rice is cooked, toss it about with a fork - making sure not to break the grains - remember, the rice must retain its....yes! integrity!! Image added on 04/09/2007, almost 4 years later! This is simply delicious!! I am my own biggest fan since Mom has passed on and there is no 'home' to go to for comfort food, I started off with doing the best I could. Now, I like what I make so much, that I can't stop raving about my own dishes! !